- Maximizes high gloss shine. 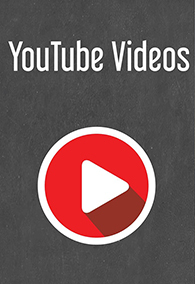 - Super slick formula for added performance. - Perfect for two bucket wash or foam cannon. If you want more gloss after your weekly wash, this shampoo is a must have for any professional detailer or weekend enthusiast. Just wash your car, truck, boat, or RV like normal and you will be stunned by the amount of gloss it adds. The pH neutral shampoo will help remove dirt, dust and all kinds of road grime while being gentle on even the most sensitive surfaces. Many wash shampoos on the market contain heavy cleaning chemicals that can remove your protective wax or sealant layer. Chemical Guys Glossworkz will not remove your wax or sealant layer to ensure your vehicle is always protected. If you have any kind of protection or no protection at all you will notice the added gloss to the surface. Glossworkz is not just a soap, it’s a super lubricating cleanser. Biodegradable, non-toxic, environmentally responsible and free of harsh detergents. It’s gentle enough to use on freshly waxed or sealed paint. Chemical Guys Glossworkz is the perfect maintenance wash shampoo that will provide your vehicle with a bright gloss and a slick finish. Chemical Guys designed Glossworkz as the first paint cleanser with the chemistry of a gloss enhancer. Advanced synthetic gloss enhancers utilize the same chemistry as our world famous detail sprays to enhance the natural shine of your paintwork. The gloss booster coats the surface to brighten and enhance your current coat of wax or sealant. Glossworkz brings the natural beauty of your paintwork back to show winning quality. Often times after a wash, professional detailers will wipe down a vehicle with Chemical Guys quick detailer spray to achieve that fresh waxed look. 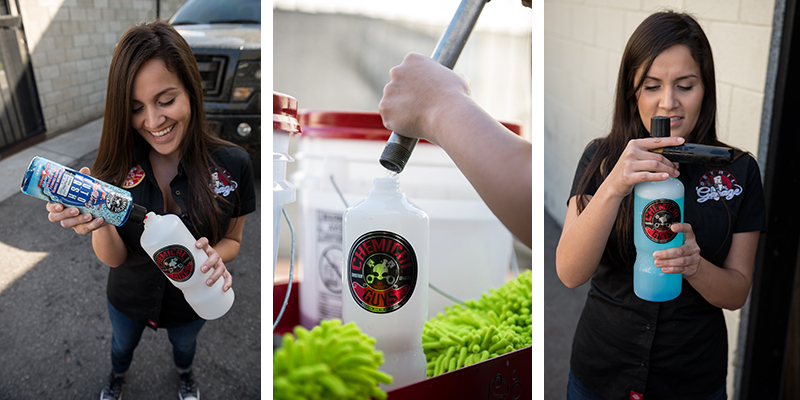 Glossworkz is designed using quick detailer formulation to give you the deep wet shine of a quick detailer spray with just a simple wash. It’s like doing two detailing tasks in 1 easy step. The gloss enhancer rinses clean from the paintwork leaving a smooth surface that is free of any dirt and contamination. 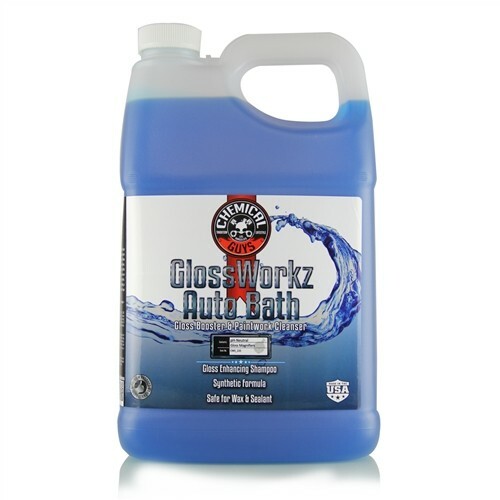 Glossworkz is the perfect way to get a high gloss shine while still utilizing pH balanced cleaning technology. 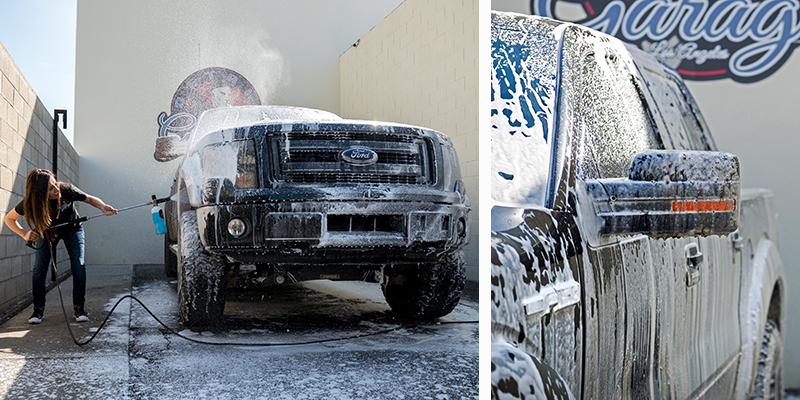 For years, professional detailers and enthusiasts have preferred pH balanced wash shampoos for the powerful cleaning abilities with safe and gentle cleaning characteristics. Chemical Guys Glossworkz is pH balanced so you can wash your car, truck, motorcycle, or RV in direct sunlight without streaks or spots. This pH balanced paintwork cleanser rinses clean to always ensure a smooth surface that is free of dirt, debris and contamination. You can safely wash your car in daylight or shade to achieve a flawless and bright shine from just a basic wash. Maintaining your vehicle’s protective wax or sealant layer is important. Wax and sealant protect your car from UV rays, water spots and contamination. Glossworkz works to maintain your protective wax or sealant layer. The unique washing formula allows dirt, grime and filth to be washed away while still maintaining your protective layer. Glossworkz is designed to wash any exterior surface with precision. Simply mix 1 ounce of Glossworkz to 4-5 gallons (+- 15L) of water to create a superior surface cleanser with a generous amount of wash suds. The advanced super polymers glide over your current wax or sealant layer ensuring that your car, truck, motorcycle, or RV stays protected against the elements. Glossworkz will show you the true definition of clean.